One of the most surprising monuments of ancient Buddhist art is found in remote, collapsing Bagh Caves. Here in 1818 were discovered significant monuments of art including some of the most amazing paintings known to be made by ancient man. Unfortunately out of initial 9 caves only 5 have been preserved up to this day. Bagh Caves were nine rock-cut caves, made in perpendicular cliff towering 45 – 50 m above the Baghani River, on the southern slopes of Vindhya Range. They are hewn in vertical face of sandstone cliff – in fact the only outcrop of sandstone in an area where for most part is found basalt. This area is beautiful, with river winding below, with forest in vicinities, traditional rural landscape around. Caves look especially beautiful during the rainy season when river has water and forest is lush green, during the ascent to caves one meets many springs. But the heavy rainfall characteristic for this district creates problems as well – it has helped to speed up natural processes to destroy the caves and it hinders access to caves. The fragile sandstone has caused discuption of caves and loss of unique art values. Heavy layer of claystone lies over the sandstone and moisture filtering through the rocks together with the heavy burden on the ceiling has caused the collapse of caves. Additional factor facilitating the desctruction of caves was the removal of trees and shrubs covering the slope in 1950s. 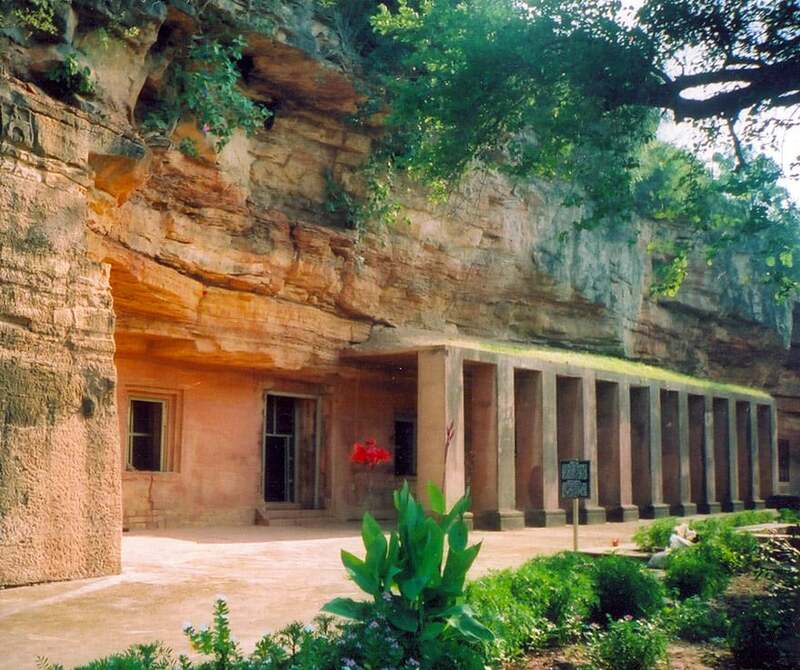 There is little known about the history of Bagh Caves. According to legend these caves were established by Buddhist monk Dataka. Earlier it was considered that caves were shaped in the 7th century AD, but find of inscription in Cave 2 changed these views and now it is considered that caves were carved in the late 4th century – 6th century AD. It is believed that with the decline of the impact of Buddhism around the 10th century AD the caves were abandoned and, according to legends, even tigers lived here. Thus among the locals they became known as Tiger (Bagh) Caves. Caves contained also a bat colony – as they were damaging the remnants of murals, this colony was removed. In 1982 there were reconstructed and reinforced the remaining paintings – plaster was carefully removed and replaced into nearby Archaeological Museum of Gwalior. The bridge over Bahgini was built to ease the year-round access to caves. The only values remaining inside the caves are numerous statues and reliefs of Buddha and Bodhisattvas as well as other carvings. The most famous features of Bagh Caves are murals made in tempera technique. Walls and ceilings to be painted were covered with a thick mud plaster in brownish orange color. Over this plaster there was done lime-priming and then paintings were laid. Similar technique was used also in Armamalai Cave further south, in Tamil Nadu. At the time of their creation the murals of Bagh were lively, beautiful, expressing vivid imagination and talent of artists. As these murals were discovered in the 19th century, they caused much admiration. During the removal of grime, soot and other dirt there were discovered paintings of unexpected beauty and sophistication – unfortunately at the time of discovery only partly preserved in Cave 3 and Cave 4, some remnants of paintings are also in caves 2, 5 and 7. Thanks to darkness inside the caves colors of paintings remained more or less unchanged. Sophistication and richness of these paintings surpasses even the paintings in Ajanta, Ellora and Karla Caves. Murals of Bagh certainly represent "golden age" of Indian classical art. All five caves are monasteries – viharas. Shrine – chaitya – is located in the back of viharas. Around the central hall of caves there are smaller cells where monks lived. Cave 2 (Pandav Cave) is the largest and structurally the best preserved one. Hall is held by 24 massive pillars. Here was found copper plate with inscription about the donation for repair of vihara by Maharaja Subandhu in the late 5th century AD. He donated to eight nearby villages to upkeep the caves. Cave 3 (Hathyakana) contains remnants of murals. Most significant is Cave 4 – Rang Mahal (Rangmahal, Rangmahala, Palace of Colors, Kalayan). This cave has the most beautiful murals on the walls of portico. This includes painting of Bodhisattva Padmapani, Mushroom paintings. Cave 5 served as a location for discussions of Buddhist monks, nowadays it forms a single body together with Cave 6. Caves 7, 8 and 9 are in bad condition, nearly fully collapsed, with remnants of their former glory. A. Pande, The Buddhist Cave Paintings of Bagh, 2002. S. Paramasivan, The Wall Paintings in the Bagh Caves – an Investigation into their Methods, 1939. Helena P. Blavatsky, From the Caves and Jungles of Hindostan, 1892. Alternate transcriptions: Bāgh, Tiger Caves, also "Ajanta of Madhya Pradesh"
The Buddhist cave paintings at Bagh are renowned for their heritage of art. However, unlike Ajanta, they have not received adequate scholarly attention so far. The walls and ceilings of the Bagh caves were once a repository of magnificent classical paintings. The remnants of the paintings, though extremely scanty now, are an important part of our rich art heritage.